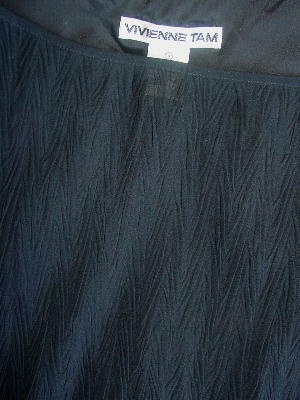 This black 100% polyester sleeveless dress has an inner full shell/slip which is totally separate from the dress. It was made in Hong Kong by Vivienne Tam. The surface has a freeform pleated design. 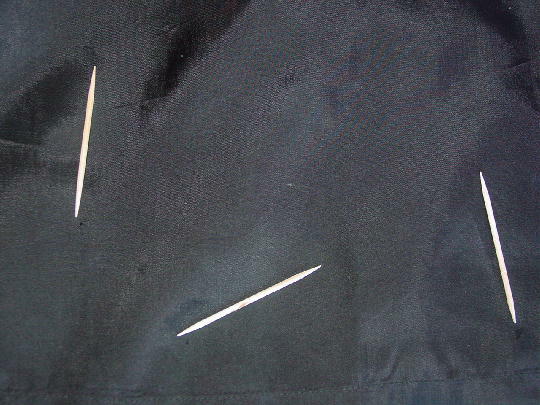 The inner slip has several very small holes (4 on one side and 1 on the other). These don't affect the appearance of the dress. The hem of the dress (because of the pleats) has a freeform scalloped effect. shoulder to hem 32 3/4"
shoulder to hem 31 1/4"